I know that I’m not alone when I admit to loving the red-carpet pre-show of award shows and especially the Oscars. It’s fun to see our favorite celebrities all dressed up, hear what they’re wearing, who they are excited to see and meet, etc. Watching the celebrities interact with entertainment news makes them a little more accessible. Every year we pick our favorite looks and misses along with shows like Fashion Police. This year featured gorgeous head-to-toe sparkles which is very much on trend for 2013, soft pale ball gowns, and classic vintage glam. 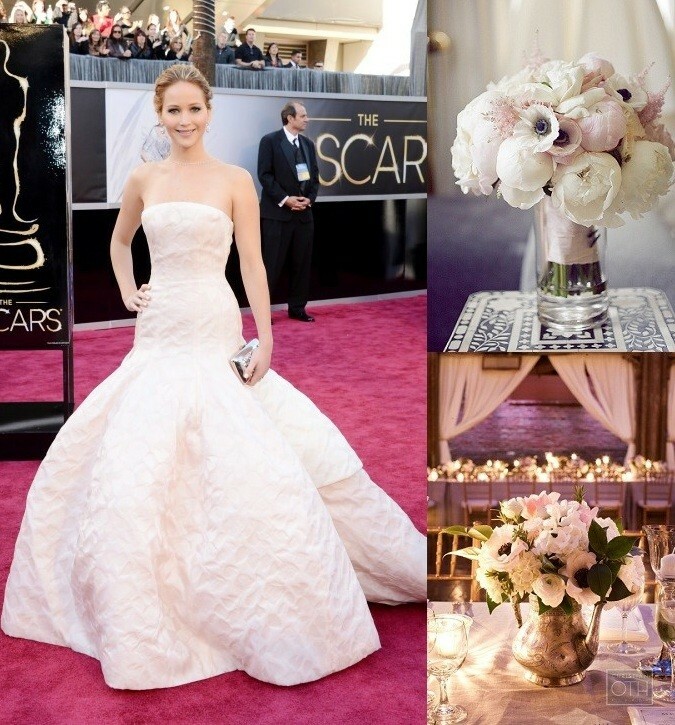 Jennifer Lawrence in a beautiful Dior Haute Couture blush pink gown. Paired with Blush, Ivory, White and Silver. 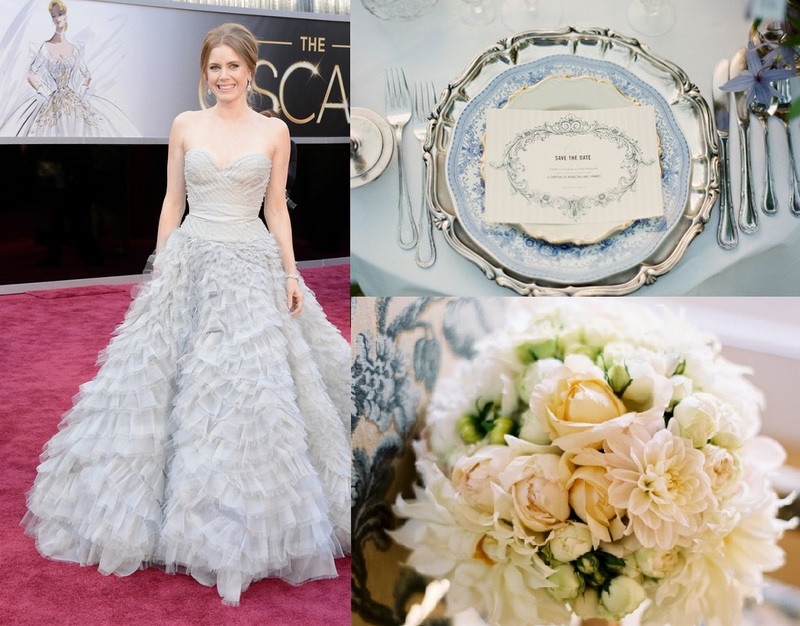 Wedding is soft, romantic and fit for a modern-day princess. 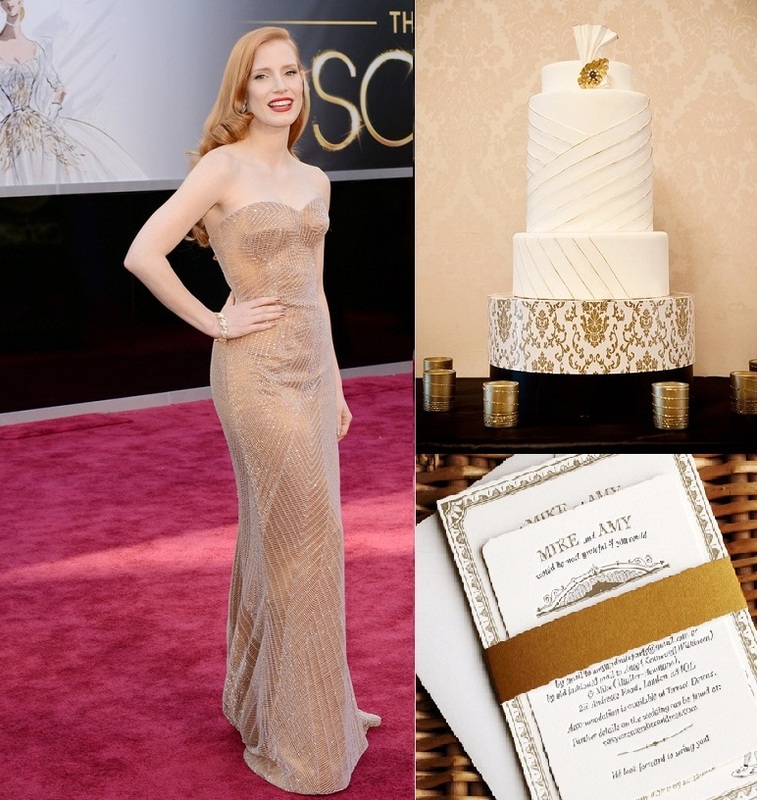 Jessica Chastain in a glam Armani Prive, perfect nod to old Hollywood. Paired with White and Gold. Wedding has an art deco inspiration; I love how the gold lines on the wedding cake match the sparkle lines on Jessica’s gown. Amy Adams in a beautiful Oscar de la Renta gown. Paired with Cream, Blue, Green and Silver. Wedding has an antique and princess fairy-tale feeling with abundant flowers; the floral textures match the soft and full skirt of the gown. Charlize Theron in a powerful and elegant Dior Haute Couture gown. Paired with Red, Pink and Silver. Wedding has a modern and refined look; a mix of architectural and artistic details. Olivia Munn is exotic and gorgeous in Marchesa. 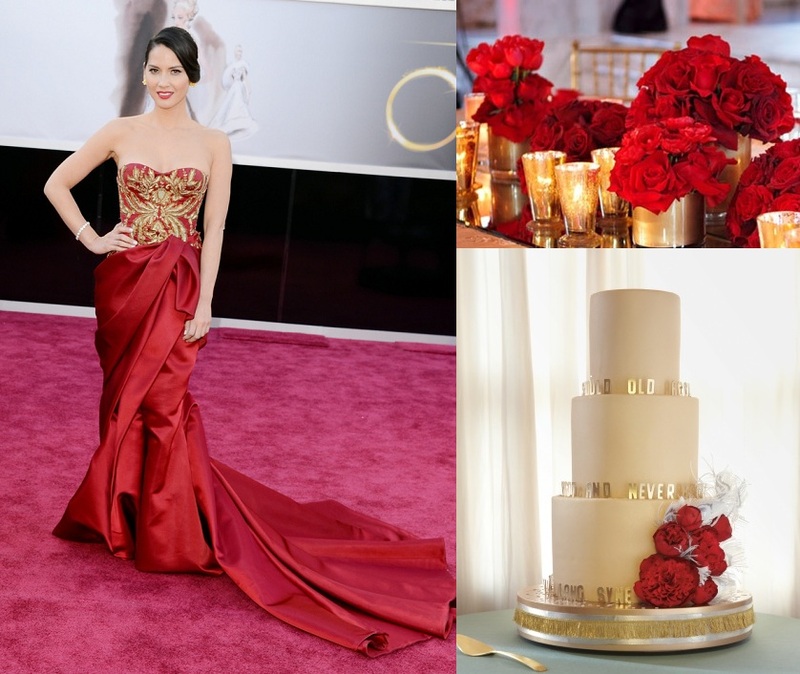 Paired with Red, Cream and Gold. Wedding has a bold, modern and elegant look. “Many wedding dresses in China, India (wedding sari), Pakistan and Vietnam (in the traditional form of the Ao dai) are colored red, the traditional color of good luck and auspiciousness” – Wikipedia. 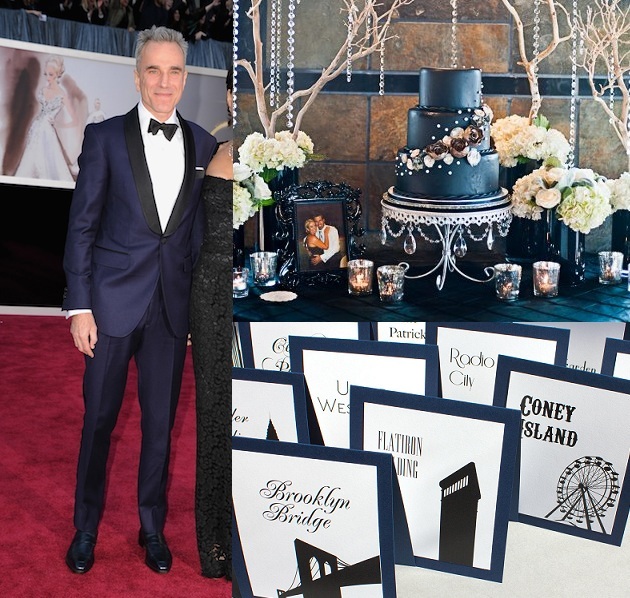 Daniel Day Lewis was my best dressed man in his custom navy-black Domenico Vacca tuxedo. Paired with Black, Navy, White and Silver. Wedding is modern, fun and whimsical.